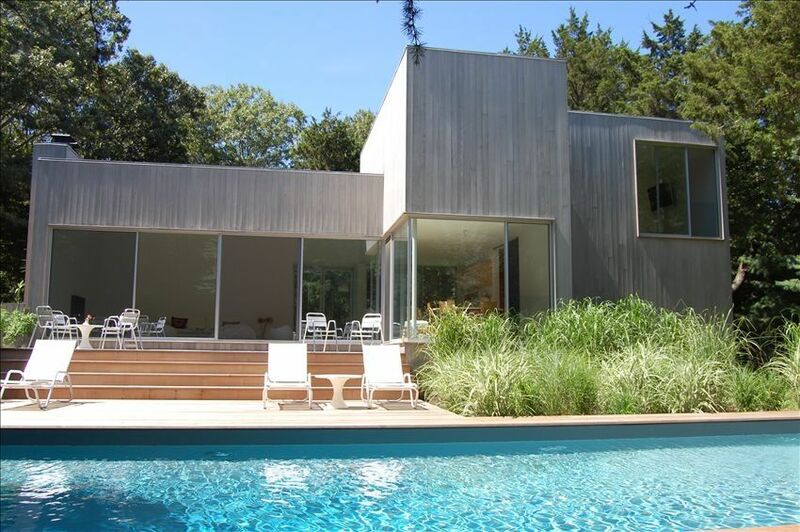 Designed by acclaimed Fernlund+Logan architects this 4 bedroom/3 bath one-of-a-kind modern minimalist home is just 3 blocks to the bay and 5 minutes to the chic village of East Hampton. Relax in this all white, glass and cedar jewelbox surrounded by towering trees in an extremely private setting. Light-filled, each room has an entire wall of glass. This home includes central air, a large heated pool and deck, outdoor shower and children's climbing structure. Full basement with playroom. First floor: large loft-like open kitchen, dining and living room that flows directly to deck and pool. One side has a guest suite, the other side has a 'children's' wing with 2 bedrooms and a large bathroom. Upstairs is a master suite with private bathroom, large bedroom and study area. There are 2 skylights and 2 glass balconies. My family and I recently stayed at 8 Gunpowder Lane and had a fantastic time. The house is very bright and light and totally modern. It is surrounded by trees and it feels very private and secluded. It is only 5 minutes to town but also walking distance to bay beaches and trails. We loved waking up to the sunshine, seeing the trees, rabbits and deer and the scent of pine trees mixed with the ocean tang. It was very quiet and peaceful. My four children, ages 4 - 17, especially enjoyed the "bunk room" with 4 beds built into the wall. Very cozy. We would enjoy being here in the Fall and of course the summer! We will definitely visit again soon! I loved staying in this home. It is bright and modern. Filled with light. Yet still feels warm. The perfect zen beach house. Quite and relaxing. Tucked away, yet close to town, this is comfortable, cool, chic retreat. Perfect for families or for couples. Beautifully landscaped pool and deck. I especially liked that the bedroom locations were separated from one another, split downstairs, and master upstairs. We had no problems with anything and slid into this house as if it were out own-without any of the hassles of owning! Oil for pool heating is additional as well as electricity.